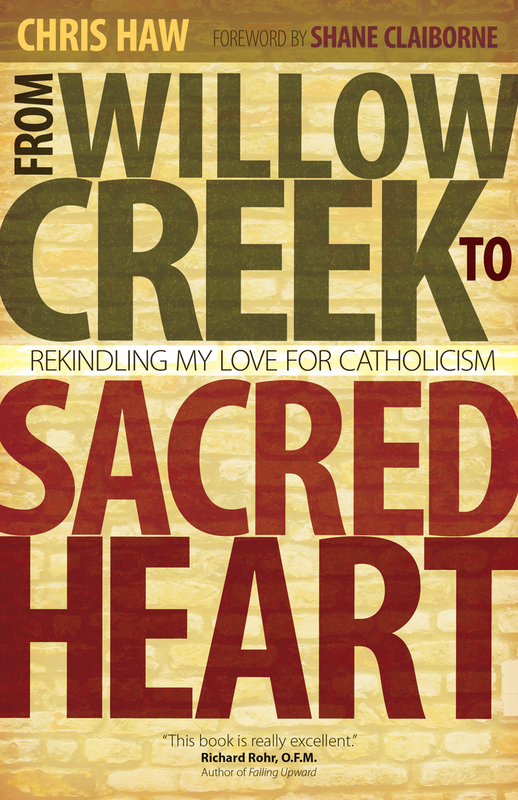 It wasn’t easy for me to read Chris Haw’s From Willow Creek to Sacred Heart: Rekindling My Love for Catholicism. Now please understand: Chris is a dear friend, and this is a great book, full of wonderful storytelling, careful thinking, and lots of detailed footnotes. It’s just that I grew up in a very anti-Catholic Christian subculture (I remember my otherwise kind Grandfather grumping that his neighbor’s shaggy and unkempt lawn must be due to the fact that “He’s Catholic!”), and have shared community with folks whose Christian identity seemed to be framed primarily against the Catholic Church. And while I don’t have the same hostilities myself, these deeply embedded prejudices die hard. Add to that the fact that Chris’s careful thinking is often pointed at my particular tribe of flat, do-it-yourself, non-hierarchical churches, and I ended up with a long and slow reading interspersed with lots of reflection. For which I am truly grateful. Chris’s narrative of his ecclesial life, activism, and theological development is not polemic, though the story is so compelling and the writing is so good that it can start to feel that way at times. He writes of the infinite from a place of profound finitude– Chris is a self-taught carpenter and potter, an urban gardener and raiser of chickens, and a salvager of building materials from the crumbling infrastructure in his home of Camden, New Jersey. He’s also a person who grew up Catholic, then got very involved in the flagship mega-church and bastion of Evangelical Christianity Willow Creek Community Church. Nourished there and empowered, he followed Willow Creek influences like Shane Claiborne and Darin Petersen to Eastern University, which was a hot-spot for social justice activism in the mid-to-late-90s. Now many years later and firmly embedded in Camden and a neo-monastic community and Sacred Heart Church right across the street from his renovated row-house, he writes as a loyal critic– a faithful disciple of his old church, which took him back to his older church, which happens to be the oldest church. What makes Chris’s book so compelling is that he doesn’t only rely on Catholic thinkers to make his case, and he doesn’t imagine that he is making an iron-clad case for a flawless institution. He delves deeply into church history in general, and theology, and plenty of post-modern philosophy to make his case (indeed, with his tendencies toward deconstruction and political inversion, Haw sounds a bit like Pete Rollins, though Chris and Pete obviously come to very different conclusions with regard to organized religion). As he does so, he refers to the weaknesses and shortcomings of his mother church, and grants others freedom to see things differently. I found his chapter “On Being a Part of a Terrible Organization: or, How to Treat the Church Like a (Dysfunctional) Family” to be particularly refreshing. He faces the recent pedophilia scandal with sobriety and gravity, and expresses his discomfort with his church’s view of women, among many other issues. I am hosting Chris at a living room socio/philo/theo/political salon on the 16th of next month, where I’m hoping to hear more about his views on hierarchies. He seemed to be grasping a bit as he suggested that Jesus was trying to establish some kind of leadership hierarchy, though Chris allows that there may be a kind of paradoxical non-hierarchical leadership structure at play here. In my view, hierarchies were an important–and essential– part of churches embedded in stratified societies (and especially the first through third centuries), but I doubt that hierarchy is an essential part of Jesus’ message, and I find it counterproductive today. In the end, everyone’s church is imperfect, and failing in one or more ways. We who gather in them are similarly imperfect– we are, as Chris notes, simultaneously sinners and saints. In the face of this, Chris invites us– to borrow a phrase from the thinker he so resonates with, G.K. Chesterton– to a place of ‘generous orthodoxy’, so that we can embed ourselves thoroughly into our local communities of faith with a hope of transforming our communities toward God’s ideal. Chris’s publisher, Ave Maria Press, has generously shared a copy of the book to be given away. If you’re interested, please leave a comment on this post (North American addresses only, please). I will do a drawing next Thursday, November 1. I ran into Chris, Cassie, Shane and Amber at a Mustard Seeds conference in Seattle a few years back. We all just happened to be staying at Fremont Abbey, having been offered a gracious hospitality by Karen Ward. That’s also where I met the Nadia Bolz-Webber, where we shared the podium behind the projection screen with sleeping bags and a lot of other folks. After sharing a meal and a walk together, I discovered our (Chris and Shane) mutual Willow Creek connections, and even similar mentors who had guided us in our formation journey. A few years later, I ended up at Eastern University as well, thanks to Shane’s recommendation for their MBA program. A few years after that, I ended up living across the street from Sacred Heart Monastery and became a Benedictine Oblate. A few years later, I officially joined the Catholic Church. I cannot wait to read this book. It is my hope to continue meaningful conversations among Catholics and Protestants in the Chicago area through the Emergent Village cohort meetings, and dream about how we can all participate together in bringing the Kingdom to earth. love it. you’re so great, mike. I can’t wait to read it! I love the way Chris writes and am fascinated by his journey! I would be interested in the book, thanks!